Does your online content need room service and housekeeping? Does your online content need room service and housekeeping? Wait What Really OK Podcast Episode 69 hosted by Brand Precision Marketing Strategist and Counselor Loren Weisman, talks about items you might want to update, delete and fix online. Does your online content need room service and housekeeping? Or maybe just a clean up, an update or a freshening up? As we all get better with posts and better with our content and information that we share but we often neglect the content, posts, ... Más informaciones audios, pictures and other items already up. Taking the time to look up and look through the past can help those first connecting with your past to have a better chance of connecting with you in the present. The assumption that many make thinking that a first impression won’t be made and once they look at something new, they will be impressed… is a very dangerous one to make. Look into what can come down, what can be updated, redirected or adjusted to allow your brand, your message, and your knowledge to shine. 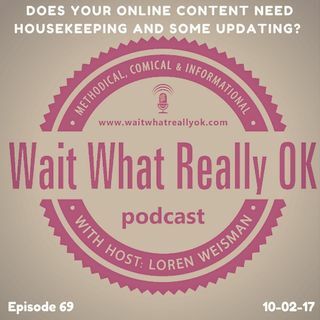 Ep 69 “Does your online content need housekeeping and some updating?” of the Wait What Really OK Podcast is available on iHeartRadio. Podcast Blog Supplement for Episode 69 of the Wait What Really OK Podcast with Loren Weisman. Podcast Link Supplement for Episode 69 of the Wait What Really OK Podcast with Loren Weisman. Why use terms like must see and can’t miss? Kill the outdated hype. Podcast Video Supplement for Episode 69 of the Wait What Really OK Podcast with Loren Weisman. Podcast Photo Supplement for Episode 69 of the Wait What Really OK Podcast with Loren Weisman.